For people who love beer, being in San Diego during the first part of November is reason enough to be thankful. San Diego Beer Week takes place Nov. 7 – 16 and bars and breweries all over the region will be holding events that will have hop heads hopping to their favorite spots. People like Scott Blair, who owns three bars catering to the craft beer crowd: Monkey Paw in East Village, Hamilton’s in South Park and Small Bar in University Heights. This is the sixth year that Beer Week has taken place and as the national reputation of the region’s local beers grows, so does Beer Week itself. Some are official, such as the opening night VIP Brewer Takeover at Broadway Pier on Nov. 7, where many of the area’s most renowned brewers will showcase their finest beers, including offerings only available at this event. Others are more informal, like a frisbee golf tournament that Blair is hosting at Morley Field during Beer Week. In addition, many local restaurants are holding unofficial Beer Week events that feature local beers but aren’t officially sanctioned by the San Diego Brewers Guild, the organization behind Beer Week. Since Beer Week began in 2009, participation — official and unofficial — has increased exponentially. That first year, 9,000 craft beer lovers enjoyed the 300 planned events within the 10-day time period, while 20,000 suds-ed it up at 600 events in 2013. Beer Week has also helped attract out-of-town visitors at a time when hotel occupancy is low: Approximately 5,943 room nights were created in 2012, due to beer industry events, yielding $789,794 in additional hotel revenue. Shawn DeWitt, who owns the Coronado Brewing Company, said bringing people to San Diego was a key rationale behind scheduling of Beer Week in November. DeWitt said that the national interest given to the area’s beer scene has been very influential on local restaurants. The beer most associated with San Diego is a Double IPA, often dubbed “San Diego India Pale Ale” and known for being very hoppy with a high alcohol content. It’s a style that started organically here and made the region’s rep, even if it’s a bit extreme for the average beer drinker. Blair believes there’s a reason why that style is popular, but hopes Beer Week imbibers recognize the breadth of the local beer scene. As the beer scene has grown, DeWitt has seen brewers become less bitter about their product. He admits that the hoppy beer styles aren’t necessarily the best pairing for 80-degree days. San Diego Beer Week takes place Nov. 6 – 17 at locations all over San Diego County. For more info about SDBW, including complete event listings, sponsors, public transportation and accommodations, please visit SDBW.org. You can also follow them on Twitter @SDBeerWeek, Instagram @sdbrewers or Facebook.com/SDBeerWeek. Use the event hashtag #SDBW. Beer Week includes hundreds of events all over the county, below are just a handful of happenings we’ve highlighted for you near Downtown. Note that many bars and restaurants are also hosting “tap takeovers” with some of the finest local and visiting beers available on draft. This event includes the chance to brew alongside Karl Strauss’ brewmaster and sample the fruits of your labor — plus vote for a winning brew. You’ll also get a pint of beer, beer-inspired food pairings and a VIP brewery tour with co-founder Chris Cramer. Plus, you’ll receive a 22-ounce bottle of their limited release Peanut Butter Cup Porter. Visit karlstrauss.com. The official opening event of SDBW includes a VIP Brewer Takeover on Friday night and a daytime tasting festival on Saturday. Unlimited beer tasting is included with all tickets. Friday’s festivities include unlimited samples of food and rare and specialty brews are showcased. The Saturday portion will include informational sessions, live music and a ceremonial cask-tapping by Mayor Faulconer. Food will be available for purchase on Saturday. Visit sdbw.org/guild-festival. 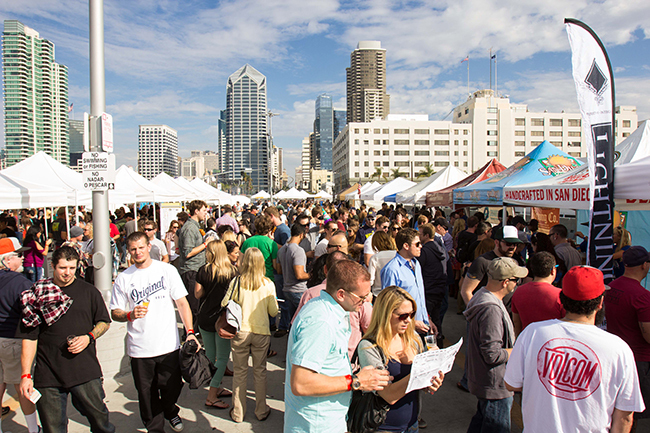 This event will pair great San Diego beer with great San Diego cuisine. Participating breweries, The Lost Abbey, Ballast Point, Acoustic Ales and more, will provide tasters of beers; and chefs from Carnitas Snack Shack, Donut Bar, Bali Hai Restaurant and Comun Kitchen and Tavern will craft the matching food samples. The event will also include a photo booth, live music and a silent auction benefiting Crohn’s and Colitis Foundation of America. Visit tomhamslighthouse.com. Stone Brewing has teamed with Colorado favorite Avery Brewing for this special five-course gourmet dinner. Each course will be paired with a specially chosen beer from each brewery. Visit stonelibertystation.com. Tickets to this event will include 10 4-ounce beer tasters with 15 local breweries to choose from. Bocce ball, ping pong and other games will be available to partake in while music is provided by ZB Savoy and Andy Mauser. A variety of food trucks will be on hand along with Alchemy Cultural Fare pouring wine and craft cocktails (food and additional drinks not included in ticket price). Visit makersquarters.com. For more details on all the events visit sdbw.org.